Thank goodness for Whatsapp academics, they never let bad taste left in the mouth die. Especially when it is a manifestation of verbal diarrhoea like situation among politicians suffering from chronic foot in the mouth disease. In the days of yore, when Parliaments were considered a cradle for the training of good politicians and the chiselling of bad ones, grooming word power, use of satire in parliamentary duels-one never heard of exchanges of abuse or fist fights among parliamentarians. Anyone that crossed the parameters of decency was put to rest by the Honourable Speaker with an effective warning. The mother of all parliaments-that is the British Parliament-is an outstanding example of a political institution where if politicians were not born, they found it to be a very rich training ground. Its history is replete with speeches made by members that make it proud and distinctive. Some of the finest pieces of oratory ornate the archival tapestry of House of Commons and the House of Lords. Speeches made many years ago like that of Edmund Burke, Disraeli and Winston Churchill to name a few-still reverberate in the ears. I am speaking of course of the below the belt attack by Pakistan Tehreek-e-Insaf (PTI) scatterbrain Asad Umer on Chairman of the Pakistan People’s Party (PPP) Bilawal Bhutto Zardari following his recent speech in the Parliament, which was described even by his opponents as the finest so far in the house. Bilawal has risen to a very high calibre in the National Assembly (NA) where buffoonery has come with the PTI’s dowry. Instead of learning from famous quips that enliven British politics, unlike ours where our politicians shout at each other instead of carrying their arrows to the target in Churchillian wit that continues to resonate in the Houses of British Parliament even to this day. Often we hear of members accusing their opponents of being traitors. In a similar example from Britain, a man abused Prime Minister (PM) Winston Churchill and called him an incompetent nincompoop. Churchill was also arrested. Human rights activists raised a rumpus in the Parliament against the arrest, Churchill having quietly listened to all the hullabaloo took the wind out of their sails when he roared in the House-‘Mr Speaker, Honourable Members of the House, yes, the accused committed an act of treason. He dared to disclose in wartime a state secret- a treasonable offence’. The entire House roared in laughter. On another occasion, a young female parliamentary assistant rushed to him as he entered the House of Commons and whispered in his ear, “Sir Winston, your fly is open”. Sir Winston shouted, “my dear, dead birds don’t fall off their nests”. Pakistan’s founder Quaid-e-Azam Mohammad Ali Jinnah, a Lincoln’s Inn Barrister by profession rising to the highest apogee of being the tallest in his profession, chose the Westminster model for Pakistan’s democratic future. If one sees the standard of debate in his lifetime and many years after too until political engineering by the powers that be marred the quality of membership, there has been rapid degeneration in their conduct. Most regretfully, instead of improving the quality of membership, the Praetorian cloning of politicians — especially after 2008 — has only produced politicians like Asad Umer and Fayyazul Hassan Chohan. What they do in the assemblies and otherwise, is much more of the same that they along with the leader of their party did in their dharnas. Their performance should have forewarned the voters to be careful in their selection. It is another thing that the voters right to elect had been forfeited by the powers that be who had opted to flood the assemblies with hordes of buffoons of their choice. In his address, Bilawal criticised the government for its failure to initiate a timely crackdown against proscribed organisations like Jaish-e-Mohammad (JeM), who are being held responsible for Pakistan’s diplomatic isolation. Asad Umer, whose claim to fame are either pedigreed to his father late General Umar who was the right-hand man of General Yahya Khan. 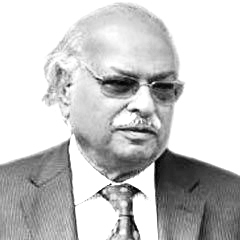 One would not like to mention Umar’s indictment as a major villain of the piece in East Pakistan tragedy as concluded by Justice Hamoodur Rehman Commission Report, nor would one like to mention the looting of Pakistani banks and Post Offices by organised gangs for the generals mentioned in HRCR that provided them capital to become big business tycoons in residual Pakistan after their ignominious surrender. Umer also took exception to Bilawal for using his mother’s name (Bhutto) instead of his father’s (Zardari). Secondly, he castigated Bilawal for delivering his speech in English to please his ‘foreign masters’. It was like the Urdu phrase ‘Ulta Chor Kotwal Ko Daantay” – (meaning thief scolding the police officer). Notwithstanding his own foreign links and having received millions in payment for services that were non-professional from his foreign masters, Umer also forgot the reference that is pending the judicial decision on charges of receiving foreign funding by PTI and its leadership. Conclusively, Prime Minister Imran Khan and his party members have come to be masters in murdering history. Criticising Bilawal for speaking English, they forget that Pakistan’s founder Muhammad Ali Jinnah spoke only English and even addressed massive public meetings in it. Khan’s followers rush to brand him as the second coming of Quaid-e-Azam without knowing how great a leader that Jinnah was and how puny their own leader is. Author is the former High Commissioner of Pakistan to UK and a veteran journalist. Published in Daily Times, March 13th 2019.